Prevent v 1.0 is a freeware app which runs on all Windows. If you don’t want anyone deleting or renaming or messing around with your data, maybe your younger sibling, then Prevent may be able to help you. Run the Prevent installer setup. The installer only places the Prevent folder in the system Program Files folder. A desktop shortcut will also be created. To run the program, click on Prevent. Set your Hot key to stop Prevent. You may set it as Ctrl+Pif you wish. Hotkeys Win+F8 kills Pre_1 and Win+F9 kills Pre_2, too. But the single hotkey set by you will kill all Prevent processes at the same time. 9. Disables Task Manager’s End Process button. Also it doesn’t allow you to right click on process name and click on end Process. 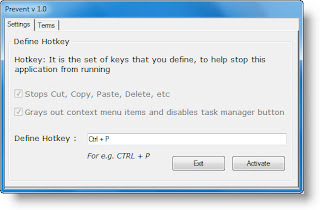 It also grays out the context menu items, disable Ctrl+C and Ctrl+V and/or stops the Process.